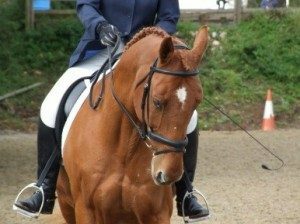 Sue did the outstanding picture of my chestnut horse ‘Rubus’ competing at dressage, The photo I liked had me competing in a different jacket and Sue had to change this to my Royal Navy uniform, as I really wanted something different and something to treasure through the years. 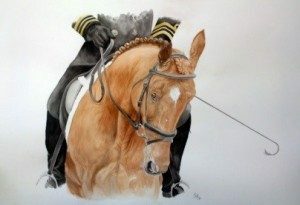 To say I love this painting is an understatement as she really managed to capture the true character of my horse and the painting is very much admired by all who see it. Thinking of having a painting commissioned then fully recommend sue as the Whole process from start to finish was a pleasure. Thank you Sue! It’s perfect and actually brought a tear to my eye. My Mum & Dad are going to love it. Thankyou so much. Just thought you would like to know that it was my Mum’s 90th birthday yesterday and she absolutely loved the picture you did of Binky!! We Skyped her in the evening & she kept picking up the picture showing it to me and saying how wonderful it was and how good the artist was!! I put it in a silver frame with a dark mount – it looked v good printed out on textured artist paper I’d got. So a VERY happy and satisfied customer, thank-you again! !